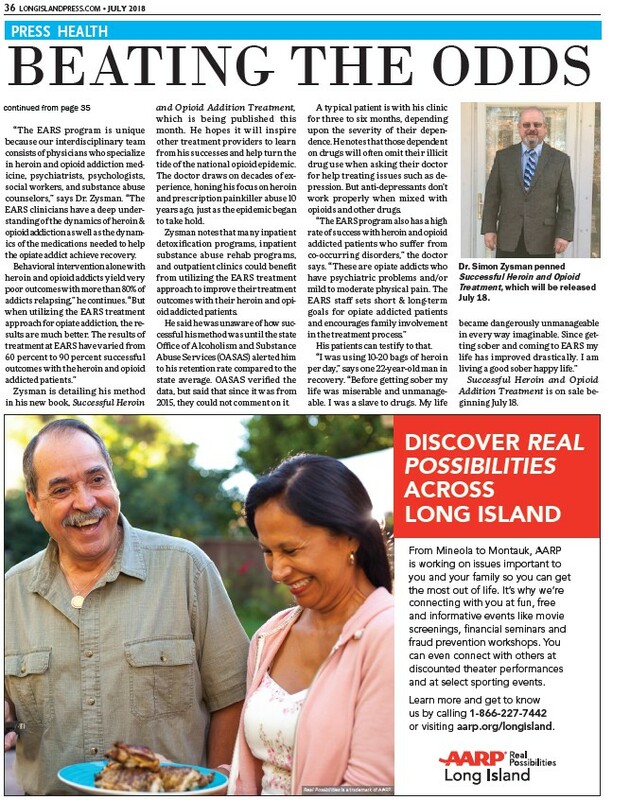 36 LONGISLANDPRESS.COM • JULY 2018 PRESS HEALTH BEATING THE ODDS DISCOVER REAL POSSIBILITIES ACROSS LONG ISLAND From Mineola to Montauk, AARP is working on issues important to you and your family so you can get the most out of life. It’s why we’re connecting with you at fun, free and informative events like movie screenings, financial seminars and fraud prevention workshops. You can even connect with others at discounted theater performances and at select sporting events. Learn more and get to know us by calling 1-866-227-7442 or visiting aarp.org/longisland. Real Possibilities is a trademark of AARP. “The EARS program is unique because our interdisciplinary team consists of physicians who specialize in heroin and opioid addiction medicine, psychiatrists, psychologists, social workers, and substance abuse counselors,” says Dr. Zysman. “The EARS clinicians have a deep understanding of the dynamics of heroin & opioid addiction as well as the dynamics of the medications needed to help the opiate addict achieve recovery. Behavioral intervention alone with heroin and opioid addicts yield very poor outcomes with more than 80% of addicts relapsing,” he continues. “But when utilizing the EARS treatment approach for opiate addiction, the results are much better. The results of treatment at EARS have varied from 60 percent to 90 percent successful outcomes with the heroin and opioid addicted patients.” Zysman is detailing his method in his new book, Successful Heroin and Opioid Addition Treatment, which is being published this month. He hopes it will inspire other treatment providers to learn from his successes and help turn the tide of the national opioid epidemic. The doctor draws on decades of experience, honing his focus on heroin and prescription painkiller abuse 10 years ago, just as the epidemic began to take hold. Zysman notes that many inpatient detoxification programs, inpatient substance abuse rehab programs, and outpatient clinics could benefit from utilizing the EARS treatment approach to improve their treatment outcomes with their heroin and opioid addicted patients. He said he was unaware of how successful his method was until the state Office of Alcoholism and Substance Abuse Services (OASAS) alerted him to his retention rate compared to the state average. OASAS verified the data, but said that since it was from 2015, they could not comment on it. A typical patient is with his clinic for three to six months, depending upon the severity of their dependence. He notes that those dependent on drugs will often omit their illicit drug use when asking their doctor for help treating issues such as depression. But anti-depressants don’t work properly when mixed with opioids and other drugs. “The EARS program also has a high rate of success with heroin and opioid addicted patients who suffer from co-occurring disorders,” the doctor says. “These are opiate addicts who have psychiatric problems and/or mild to moderate physical pain. The EARS staff sets short & long-term goals for opiate addicted patients and encourages family involvement in the treatment process.” His patients can testify to that. “I was using 10-20 bags of heroin per day,” says one 22-year-old man in recovery. “Before getting sober my life was miserable and unmanageable. I was a slave to drugs. My life became dangerously unmanageable in every way imaginable. Since getting sober and coming to EARS my life has improved drastically. I am living a good sober happy life.” Successful Heroin and Opioid Addition Treatment is on sale beginning July 18. continued from page 35 Dr. Simon Zysman penned Successful Heroin and Opioid Treatment, which will be released July 18.